Their approach has generated a concept so logical yet transformational that it secured $5 million funding from Chinese Investment Company, Tencent Holdings Ltd, in 2015 and retail distribution through US retail giant Best Buy. Andrew and Hon are the co-founders of CliniCloud: a company that produces medical diagnostic tools linked to phone Apps for home and clinic use. CliniCloud’s products collect high quality data for diagnosing and monitoring a range of common health conditions and, to date, the company has produced a digital stethoscope and non-contact thermometer that work with a self explanatory smartphone App to generate, collect and store data that can be remotely accessed and assessed by a doctor. CliniCloud’s home kit combination of a stethoscope and a thermometer provides powerful diagnostic data that allows the diagnosis of respiratory conditions, heart failure and many other common health problems. “A lot of the time doctors only see a snapshot of a patient but having a timeline of a huge amount of medical-grade quality data gathered by patients at home on a regular basis could be a game changer in catching and preventing health issues—and noticing trends—early on,” explains Andrew. 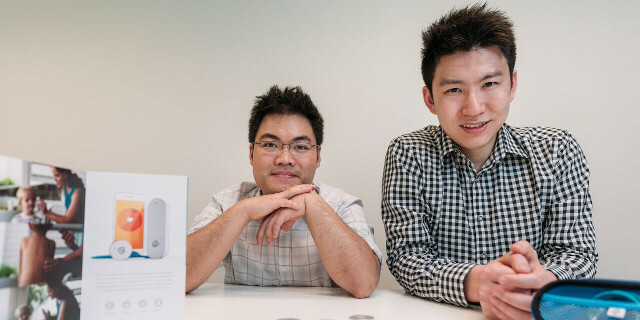 The CliniCloud founders hope to eventually see the devices in every home and also in hospitals. Their bold vision does not seem so out of reach given their success so far – in the five years since they graduated the company has grown to 17 employees, almost all of whom are graduates of Melbourne Medical School, Melbourne School of Design, Melbourne School of Engineering. Andrew will present at this year’s MD conference on 28 June.